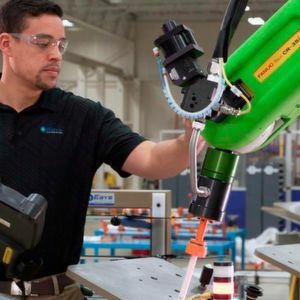 With the growing demand for high quality processes that ensure accuracy and precision along with the need to automate tedious tasks, manufacturers are looking at collaborate robots aka cobots to assist them on the shop floor. What is a collaborative robot? A collaborative robot or cobot can be defined as a robot intended to physically interact with humans in a shared workspace. 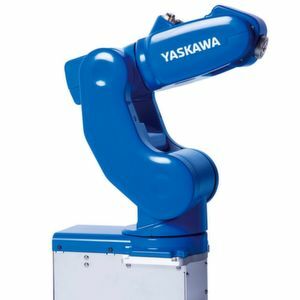 According to a positioning paper titled ‘Demystifying Collaborative Industrial Robots’ by the International Federation of Robotics (IFR), cobots are designed to perform tasks in collaboration with workers in industrial sectors. In other words, this means that cobots have been created to work together with humans in a shared workspace in order to carry out tasks that ensure greater accuracy and precision in the production process. Collaborative robots are mainly used across the manufacturing sector such as automotive and electronics. Healthcare, food packaging, logistics, and construction are some of the other fields that make use of collaborative robots. The global collaborative robots market is expected to be worth almost 9 billion dollars by 2025, demonstrating a compound annual growth rate of nearly 47 % from 2018–2025, states a report by market research company Research and Markets. Supporting this view, Swaminathan Ramamurthy, General Manager of Robotics Business Division, Omron Asia Pacific says, “Consumer demands and expectations are increasing, leading manufacturers to search for quick but flexible ways to set up their production lines and meet frequent product changes. This, in addition with a skilled labour shortage in many markets has led many to automate the simplest and most monotonous tasks to optimise their workforce and place talent in the most strategic roles.” He adds that tasks like picking, packing, and simple assembly procedures are being automated and carried out by collaborative robots in response to these market changes. Page 1: The rise of cobots!